In the spring of 2006, a friend of mine asked me to take over a bike-a-thon our community puts on every year. With having my niece Lauren who received treatment from St. Jude Hospital, I couldn’t say no. I received the packet and started to work on the bike-a-thon. I put up fliers, sent letters to schools, churches ect. That year we raised $64.00 and I was so upset thinking I did everything I could. I knew there had to be a better way to raise money for such a wonderful place. So with a little brain storming and with the help of the Knights of Columbus, a group from St. Gabriel Catholic Church, we came up with a jambalaya cook-off. After all we do live in South Louisiana near the Jambalaya Capital of the World in Gonzales. 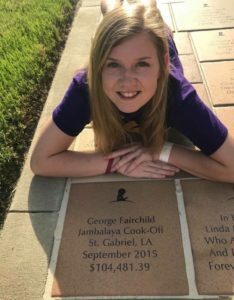 What better person to name it after than George Fairchild, the first Jambalaya Champion of the World Famous Jambalaya Festival held in 1968. 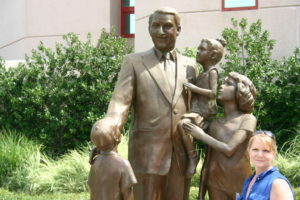 George Fairchild Sr. was born and raised in St. Gabriel, Louisiana. Papa George (a nickname everyone called him) is considered The Jambalaya King. We were just thinking we would have 10 or 15 cooks and called Tammy of the Jambalaya Association to get the ball rolling. The first year in 2007 we raised $11,743.52 with 42 cooks. 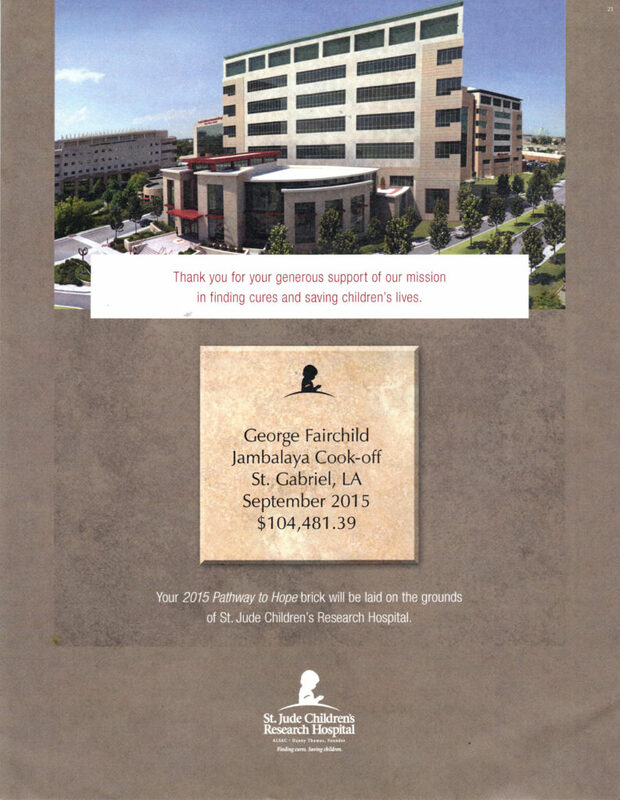 To this day we have raised over $100,00 for the children of St. Jude, with an average of 60 cooks. Jambalaya is sold for $5.00 a plate and the ladies of the community bake delicious sweets to be sold. We also raffle numerous items such as handmade quilts and other items donated by the community and our corporate sponsors with raffle tickets costing $1.00. We also sell t-shirts, koozies, hats and towels, you can also buy beer and refreshments. There are also activities for the kids such as face painting and a petting zoo and live entertainment.